CHICAGO -- Two skydivers are hospitalized after a mid-air collision during the Chicago Air and Water Show Saturday morning. Both of the injured were brought to Northwestern Memorial Hospital. The U.S. Army Golden Knights jumper is in critical condition after crashing into a building on Lake Shore Drive, U.S. Navy Leap Frogs jumper is in stable condition with a lower leg injury. Military spokespersons are not saying much about the accident, but will confirm that it appears that the skydivers, who jumped from two separate planes, collided mid-air just before 10:30 a.m. Saturday morning. When the Navy skydiver landed on the beach he was visibly hopping and had to be taken away on a stretcher. More seriously however, the Army skydiver collided with a building in the 1400-block of N. Lake Shore Drive. "We heard a noise in the sky, my girlfriend and I," said witness Daniel McSweeney. "We saw a reserve chute, didn't know what that means at the time. It was really scary. He was coming in really low and appeared to be motionless." At first, McSweeney said he thought it was part of the act. The parachutist was coming in so low, he said he and his girlfriend waved. "Just cleared the top and then we heard contact," he said. "He clipped it and at that point, really tragic. He fell about 30 stories. We got there right in time and called 911." Bystanders said they did what they could to help and keep the Army skydiver alive until paramedics arrived several minutes later. The afternoon performances by both parachute teams were cancelled. The Leap Frog is said to be in stable condition Saturday night after suffering a lower leg fracture and will spend the night in the hospital. The Golden Knight's condition, however, is far more serious, although the extent of his injuries has not been revealed. An investigation into what led to the collision is underway. Crowds gathered along Chicago's lakefront to claim their spots early Saturday morning. Michelle Carter, from Aurora, says she's been coming to the show with her family for 25 years. "It is something my husband enjoys and we wanted to pass it on to the kids and they just love it," she said. "They love being out here on the beach and playing in the water, seeing the planes. We're just a military family, so that's why we do it year after year." The show, now in its 57th year, draws veterans and rookies alike. "I want to see some great stunts by the Blue Angels, I can't wait to see what's going to happen on the water - as far as I can remember, this is my first one," said Cody Buchanan, an attendee. 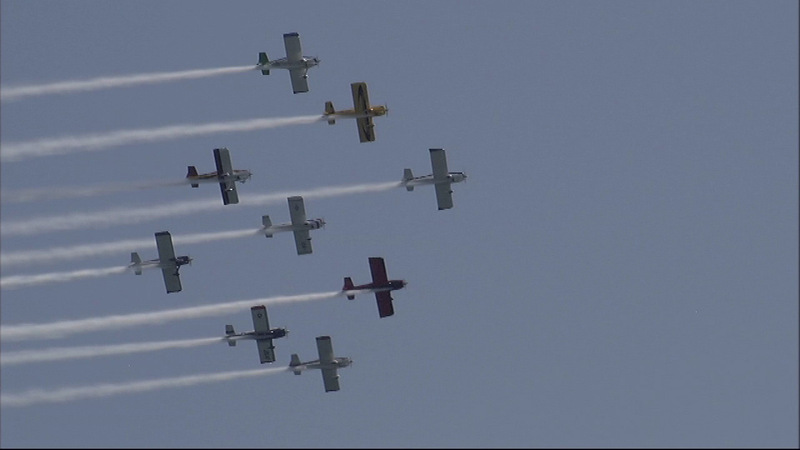 Crowds gathered along Chicago's lakefront Saturday for the first day of the 57th annual Chicago Air and Water Show. The weather was a concern, as humidity levels are high and temperatures are near 90 degrees in many places, which had thousands of spectators struggling to stay cool. The show will continue Sunday from 10 a.m.- 3 p.m.